When Diana Hun left her home in Panama City, Panama, to attend school at the University of Texas in Austin, she knew she wanted to be an engineer. Exactly which branch of engineering to pursue was not quite as straight-forward. Hun studied both mechanical and electrical engineering until settling on civil engineering for her master’s degree. “I was lucky to have the opportunity to explore,” said Hun. “I even went to architecture school because I like design, but I discovered that I wanted something more tangible.” After working as a structural engineer for eight years, she found her place among the engineering disciplines and returned to the University of Texas for her Ph.D. in civil engineering, which was funded by the National Science Foundation. “Again, I was very fortunate because the grant was an opportunity to explore any topic that was related to the indoor environment,” said Hun. “My dissertation was about human exposure to hazardous air pollutants in homes. I collected data from mostly low-income homes, which largely were inhabited by Hispanics.” She, of course, is fluent in Spanish. Her findings include that cancer risks among Hispanics appear to be disproportionately affected by certain hazardous air pollutants from indoor and outdoor sources. 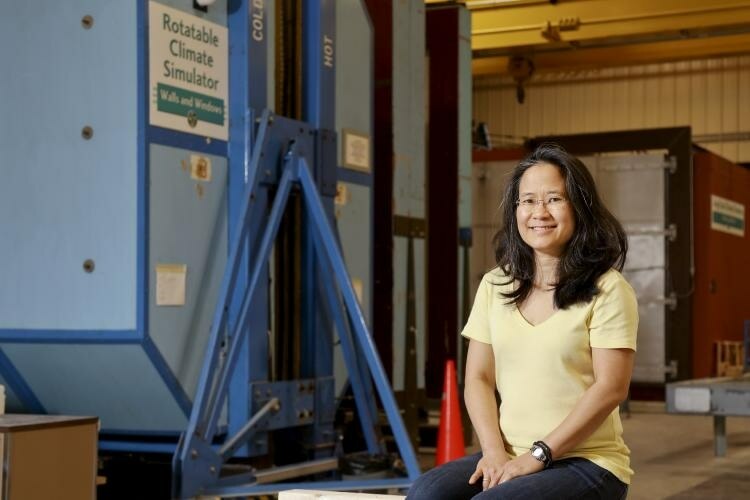 Hun’s career path eventually led to the Buildings Technologies & Integration Center at DOE’s Oak Ridge National Laboratory, where she joined the R&D staff in 2010. She became interested in energy efficiency in building envelopes early on in her career and has lent her expertise to numerous projects. “One of the reasons I went back to get my Ph.D. was that I wanted to understand buildings from a holistic perspective, specifically in regards to energy efficiency,” said Hun. “I wanted to be involved in sustainability, to see the big picture.” Given that buildings in the United States account for 40 percent of all energy consumed in the country, Hun’s work is vital to energy security and environmental protection. Is energy efficient lighting efficient enough? Through the U.S.-China Clean Energy Research Center for Building Energy Efficiency (CERC BEE), Hun worked with Dow Chemical on the development and evaluation of a new liquid flashing, LIQUIDARMOR. The sprayable and paintable sealant was recognized as a 2015 R&D 100 finalist and won the 2016 Gold Edison Award for Building Construction and Lighting Innovations. The agreement between the United States and China is important because the two nations are the world’s largest energy producers, energy consumers and greenhouse-gas polluters. Hun also used her knowledge of energy-efficient building materials in another CERC BEE project—the evaluation of 3M’s Air and Vapor Barrier 3015, a translucent adhesive film that can decrease energy use significantly. For both projects, Hun used ORNL’s unique Heat, Air, and Moisture (HAM) chamber that measures the impact of various environmental conditions on wall assemblies. Hun was instrumental in the design, development and construction of the chamber. Hun cites two reasons why she likes working at ORNL: the state-of-the art facilities and being able to pick up the phone and call another expert on the ORNL main campus for a quick consultation. With the renewal of the United States’ and China’s commitments to the research center for another five years, Hun will continue her work on energy efficiency for building envelopes. She is leading a multi-disciplinary team of researchers from around the lab, including building construction, advanced composites, material sciences and 3D printing and industry on how to improve the performance of precast insulated concrete walls. Another project is to improve the efficiency of existing commercial buildings. Hun likes to travel and take in the architectural features of both old and new buildings. When she’s not concentrating on ways to improve building envelopes, she listens to podcasts. “They reduce stress, clear my mind and educate me about all sorts of things going on in the world,” she said.